Labyrinthitis is an inner ear disorder. The two vestibular nerves in your inner ear send your brain information about your spatial navigation and balance control. When one of these nerves becomes inflamed, it creates a condition known as labyrinthitis. 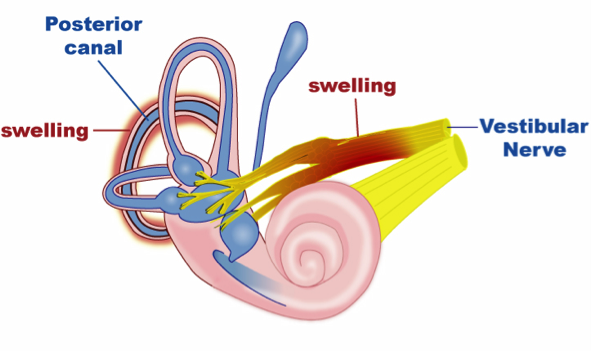 If you would like to learn more about Labyrinthitis, please check out this link. Most of the time, labyrinthitis and vestibular neuritis go away on their own. This normally takes several weeks. If the cause is a bacterial infection, your doctor will give you antibiotics. But most cases are caused by viral infections, which can’t be cured with antibiotics. In those situations, your doctor may prescribe steroid medicines, which may help you get better sooner. Avoid television, computer screens, and bright or flashing lights during a vertigo attack. If vertigo occurs while you’re in bed, try sitting up in a chair and keeping your head still. Low lighting is better for your symptoms than darkness or bright lights. If you have any further queries please call PhysioNow. Our experienced physiotherapists would be happy to clear your doubts.